The TS12 Stealth features an exclusive close-coupled design for low tongue weight and shorter turning radius, for tractors with 35-50 horsepower. This machine’s unique ‘stealth’ appearance — a very short wheel base, and anti-scalp features — make this the ideal machine for customers who need a flex-wing cutter’s versatility but may not have a tractor large enough to pull a 15 foot unit. • Designed for Tractors with 35 - 50 PTO HP. • Short Turning Radius for Cutting Small Areas. • Low Tongue Weight for Smaller Horsepower Tractors. • Unique “Wing-Bar” Blade Carrier Protects the Gearbox Output Shaft with Minimal Weight. • Equal-Angle, Fully Pivoting Tongue and Direct Acting Suspension System for Uneven Terrain. • Smooth Decks for Easy Cleaning and Unobstructed Underside for Airflow Through the High-Volume Cutting Chamber. 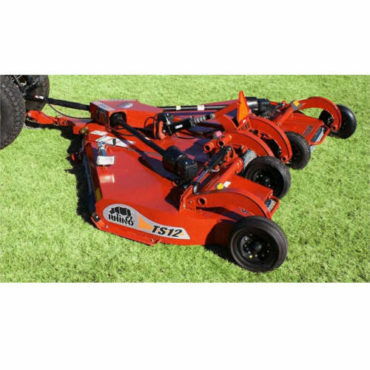 • Provides Dramatic Reduction in Mowing Time. • Large Center Skid Shoes and Tapered Wing Shoes Provide Anti-Scalping Protection. • Chain Guards Included for Protection.